I don’t know about you, but I have this obsession with toilets. I do know that when you have to go, you have to go. But there is still something about public toilets that makes you NOT want to even step inside one. Especially in countries which are developing (or underdeveloped or third world, depending on how politically correct you are). If you feel the same way about the comfort room (understand it or not, that’s how it is called in my neck of the woods), then you just might understand what was going on in the minds of the guys who created this new app called CLOO’. 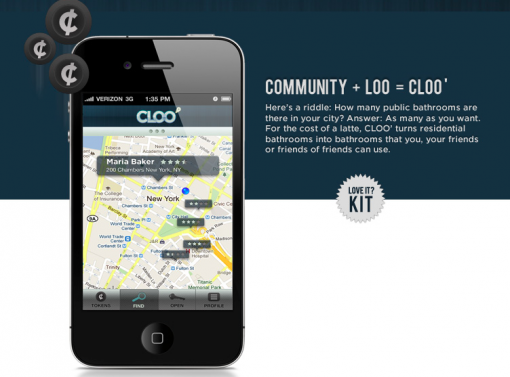 “CLOO’ is based on one simple truth— we all have to pee. Though in urban cities finding a clean, available restroom is difficult & frustrating. That’s where CLOO’ comes in. On your part, how safe do you feel leasing a private room to total strangers? I guess it is not much different from renting out rooms, but I personally don’t feel comfortable with the idea. But hey, I am only one voice. Would you go on CLOO’? Learn more about it on the CLOO’ web site.